» What is Digital Ear Real-time® ? Digital Ear reads all popular audio files (.wav, .mp3, .wma etc.) or accepts live microphone input. » View your voice features at a glance! Current note is viewed on the keyboard (left top). The blue dot on the keyboard becomes bigger when your voice becomes louder, while the color of the dot becomes brighter as your voice becomes brighter ! » Customize Digital Ear. Each musical instrument or human voice is unique. Digital Ear is flexible. It is not constrained in a specific musical instrument, or voice! Unlike conventional so-called «Pitch-to-MIDI» converters, Digital Ear will send high-resolution pitch events closely matching those of your original sound. 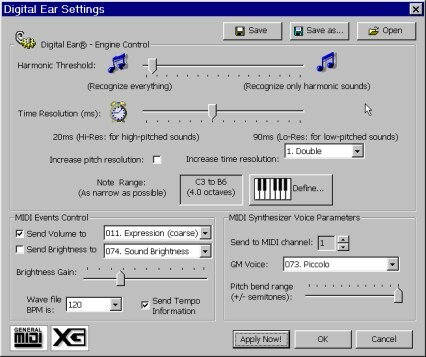 Any vibrato, tremolo, pitch-bend, or portamento effects of your recorded sound will be faithfully converted into MIDI events that can by reproduced into any voice of your synthesizer or sound card.Only Digital Ear can capture the nuance and expressive power of the human music player or vocalist. 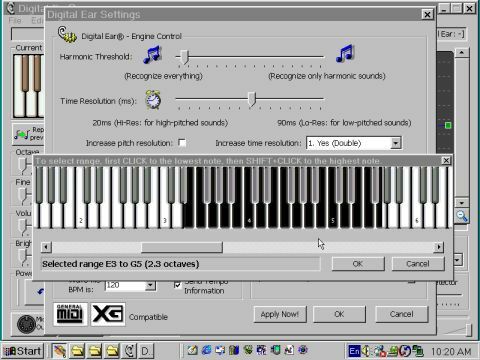 The Real-time edition of Digital Ear can directly convert audio directly from the microphone into MIDI! The possibilities are endless: E.g. let your voice to control a virtual pan flute, or just view how good your intonation is using the on-screen pitch display. Correct your voice's pitch errors with the Soft Quantization tool. 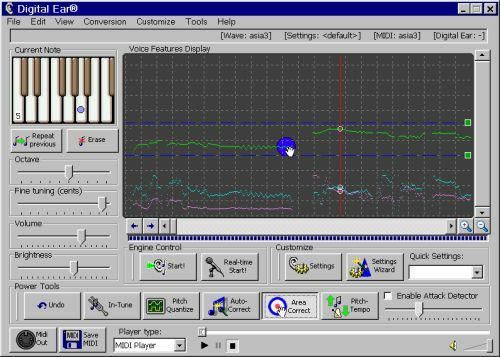 » Convert to MIDI in Real-time and view your intonation as you sing or play a musical instrument. » Digital Ear in action! A unique feature of Digital Ear not found elsewhere, is the capturing of detailed volume envelope and timbre dynamics events. These features can really boost your synthesizer's voice realism and enhance your musical expression. Your MIDI files will never sound the same again. State-of-the-Art recognition engine. Based on the latest psychoacoustical research on human pitch perception. Captures with incredible accuracy and speed instantaneous pitch, volume, and timbre dynamics, with minimal errors. Settings Wizard: This is a advanced feature of Digital Ear 7. It allows you to find automatically the optimal settings for a particular audio file for best conversion results without trouble. Smart Attack Detector: Accurately recognizes note onsets. This feature is particularly effective for string instruments. On-the-fly real-time sensitivity adjustment. * Specifications in this document are subject to change without notice.